We have many vines in the Southeastern US, and though some cause problems, many are a valuable part of our ecosystem – such as the vines pictured here: trumpet vine (at right), beloved by hummingbirds, and yes – even poison ivy (at left) berries are an exceptionally high value food source for birds. Eco-A, Trees Atlanta and West Atlanta Watershed Alliance invite you to an invasive vine removal training at Grove Park. Well show you how to identify the “good,” native vines, and explain their many benefits (including one you can even eat!) 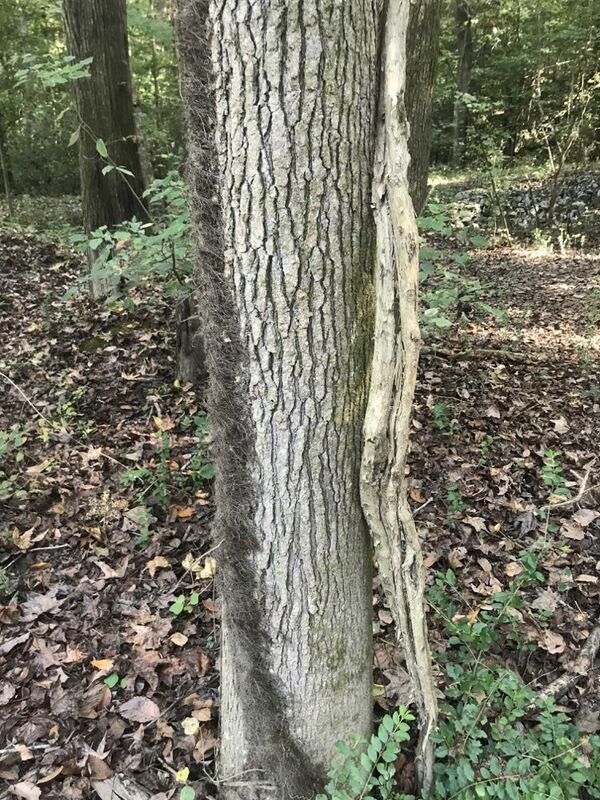 — from the “bad” non-native invasive vines such as kudzu and English ivy that kill trees and threaten our native biodiversity. We’ll have a special focus on how to remove creeping kudzu from your yard, without having to use poisonous chemicals, without having to constantly fight back vines, and without having to dig out deep entrenched roots. We’ll show you how to just follow the vines back to the root and cut off the top of the “root crown,” so that it cannot resprout. A donation of $15 or more helps our programs.